As farms continue to consolidate it becomes increasingly important to assess a farm’s management skills. At a certain farm size, it is no longer easy or feasible for the manager or managers to wear every management hat. How does the management team determine when to focus on professional development, delegate management tasks among mangers, and seek outside assistance? This is the fourth article in a series of articles pertaining the assessment of management skills. 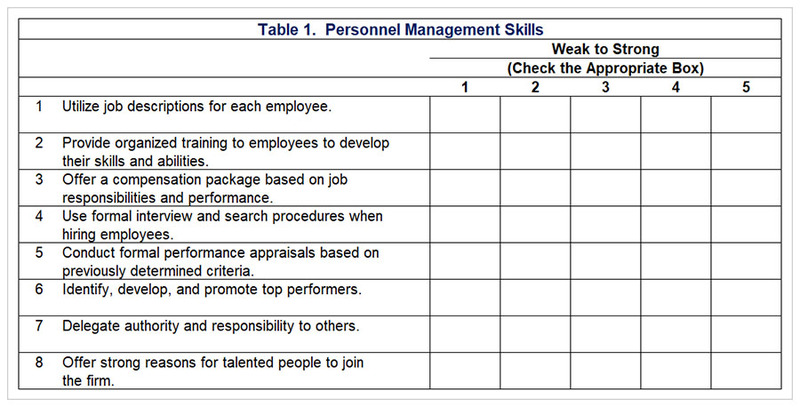 The topic of this article is the assessment of personnel management skills. Table 1 presents important personnel management skills. Skills listed include utilizing job descriptions; providing training and orientation to employees; developing a compensation package based on job responsibilities and performance; utilizing formal interview and search procedures when hiring employees; conducting formal performance appraisals; identifying, developing, and promoting top performers; delegating authority and responsibility to others; and offering strong reasons for talented people to join the farm. Each farm operator should rank their ability with respect to each skill using a 1 to 5 scale with 1 be relatively weak and 5 being relatively strong with respect to that skill. The idea behind checklists such as that presented in Table 1 is to assess whether a farm has a skills gap, which is defined as the difference between skills that a farm needs and the skills of their current workforce (operators and employees). Conducting a skills gap analysis helps a farm to identify skills that will be needed to become more efficient and expand. It can also be an important input into hiring programs, employee development plans, or hiring outside consultants. The checklist in Table 1 does not include a final tally score, nor does it address tradeoffs in various skill or ability areas that may lead to success. Rather, the checklist helps farm operators evaluate their skills and abilities in areas critical to long-term financial success. As farm operators fill out the checklist, they should try to determine which of the skills listed are most essential to improving efficiency and expansion plans. The five functions of management include planning, organizing, controlling, staffing, and directing. Planning provides direction for the business. Organizing involves grouping the tasks to be done and then assigning individuals or groups to accomplish these tasks. The control function examines how well actual farm performance relates to business plans and goals. Staffing relates to hiring employees and developing them to achieve goals and objectives. Directing involves supervising and guiding employees so that the employees can successfully complete their assigned tasks. Staffing and directing are related to the skills listed in Table 1. Before discussing these two management functions, it is important to note that managing both family and non-family employees is essential for business success (Erven, 2000; Erven and Milligan, 2000; Lencioni, 2002). As farms grow, they often need to hire additional employees. In tight labor markets, farms must compete with non-farm businesses for quality employees. We encourage farms to answer the following question. Is my farm a highly desirable place of employment? The staffing management function includes employee recruitment, employee selection, training and orientation, and managing employee performance (Milligan and Maloney, 1996). When recruiting employees, a farm needs to assess the external environment, identify long-term personnel needs, and develop a recruitment plan. The selection process involves developing an application, setting up an interview process, checking references, and determining whether a trial period is needed for a particular job. Effectively training an employee can help avoid error and poor performance. Part of the training process is to develop an orientation program, particularly pertaining to the first few days of employment. Performance management involves establishing performance expectations, providing regular coaching and feedback regarding employee performance, and conducting a performance appraisal interview. The directing management function includes leadership, employee motivation, communicating, employee discipline and discharge, and total quality management (Milligan and Maloney, 1996). Leadership dimensions include vision, motivation, integrity, and knowledge. A motivational work environment can be accomplished by hiring individuals with the potential to achieve, considering individual wants and needs, and setting a good example. Part of motivation is related to compensation (wages, benefits, and perks). However, compensation is not the “be all and end all” when it comes to motivating employees. In addition to oral communication, good communication involves listening and effectively managing conflict. To attain peak productivity of employees, the supervisor needs to have a vision of what success means, communicate that vision to employees, create performance standards, and provide the training and resources needed for employees to meet performance standards. Discipline occurs when an employee’s performance is not consistent with established standards. Total quality management involves managing quality, technology, changing work force expectations, and competitiveness. Successful supervisors have a commitment to success, accept that people are a critical asset to the business, and are committed to providing the training and support needed for employees to improve on the job. Assessing management skills is an important part of benchmarking farm performance and figuring out where improvements may be needed. If the operators on the farm identify management areas which are not currently being addressed, they will need to determine whether someone is going to get up to speed with regard to these areas or outside help is going to be sought to address weaknesses. Personnel management skills help ensure that all individuals in the organization understand their roles, be trained to perform them, and work effectively as a team. Good human resource managers are not born. Rather, they learn their personnel management skills over time through effort and attention. Learning these skills can reap rewards such as employee retention, low turnover, and improved productivity. Erven, B.L. “Building Your Reputation as an Employer,” Department of Agricultural, Environmental and Development Economics, Ohio State University, August 2000. Erven, B.L. and R.A. Milligan. “Business Success through People-Oriented Management,” August 2000. Lencioni, P. The Five Dysfunctions of a Team. San Francisco: Jossey-Bass, 2002. Mahoney, T.R. and R.A. Milligan. “Human Resource Management for Small Business Managers,” 1996. How Tough of a Year was 2018 for Ethanol Production Profits? The U.S. ethanol industry faced considerable headwinds in 2018, including the lowest prices over the last decade, policy setbacks in the implementation of the RFS, and political resistance to granting a year-round RVP waiver for E15. The impact of these headwinds on ethanol production profits is certainly of interest to those in the ethanol industry, as well as policymakers and legislators interested in the financial health of the U.S. renewable fuels industry. 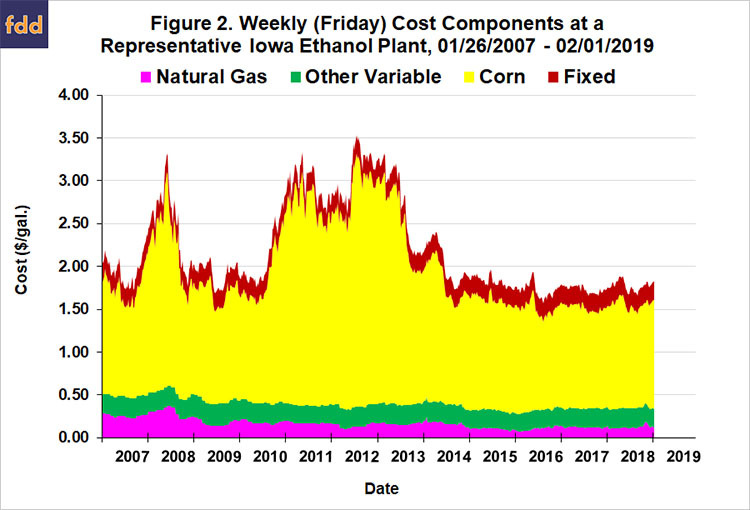 The purpose of this article is to estimate the profitability of U.S. ethanol production in 2018 using the same basic model of a representative Iowa ethanol plant that has been used in earlier farmdoc daily articles on the subject (e.g., January 6, 2016; February 1, 2017; March 14, 2018). Netback (marketing) costs of $0.05 per gallon of ethanol and $4 per ton of DDGS. To track plant profitability over time, weekly ethanol and DDGS prices at Iowa ethanol plants are collected starting in late January 2007. Crude corn oil prices for the Midwest are available from OPIS. Natural gas costs over 2007-2013 are estimated based on monthly industrial prices for Iowa available from the EIA. Since January 2014 the Iowa industrial price has only been reported sporadically, and when reported, has been out-of-line with its historical relationship to nearby natural gas futures prices. Consequently, a regression relationship between nearby natural gas futures prices and natural gas costs over 2007-2013 is used to estimate natural gas costs starting in January 2014. 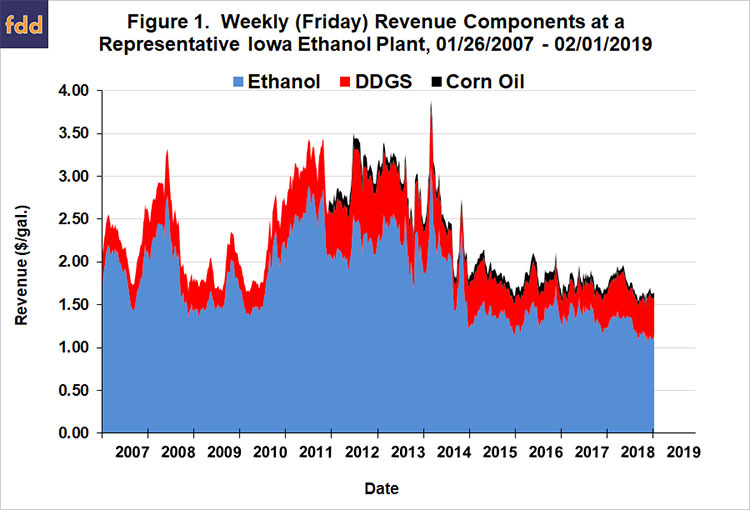 Figure 1 presents the three components of plant revenue per gallon—ethanol, DDGS, and corn oil—on a weekly basis from January 26, 2007 through February 1, 2019. The chart shows that ethanol prices (net of netback marketing costs) started 2018 at historically low levels of $1.25 per gallon, rose to a peak of $1.43 in April, and then fell most of the rest of the year, reaching a low of $1.06 in late November. The November low was the lowest weekly price for ethanol in this time period. DDGS prices were a bright spot for the ethanol prices for most of 2018, with prices generally ranging from 1.1 to 1.3 times the price of ethanol. This was a major turnaround in DDGS prices from 2017. The rise in DDGS prices was not enough to lift total revenue in 2018 above 2017 levels. Total revenue in 2018 averaged $1.75 per gallon compared to $1.76 per gallon in 2017. Figure 2 shows the four major cost components for producing ethanol. The cost of corn is the major input cost, about 70 percent of variable and fixed costs on average, and since the price of corn was relatively stable again in 2018, average total variable costs for the year of $1.55 per gallon was only slight higher than in 2017. Figure 3 presents (pre-tax) estimates of ethanol production profits net of all variable and fixed costs. Net profits in 2018 averaged a loss of -$0.02 per gallon, compared to gains of $0.03 in 2017, $0.12 in 2016 and $0.07 in 2015. In reality, the pattern of net profits in 2018 was a tale of two periods. The average net profit from January through July was a respectable $0.05 per gallon. Mirroring the sharp decline in ethanol prices, returns from August through December averaged a loss of -$0.11 per gallon. Net profits turned negative in the second week of August 2018 and have remained so through the most recent week of available data. This is a run of 26 consecutive weeks of losses and counting. 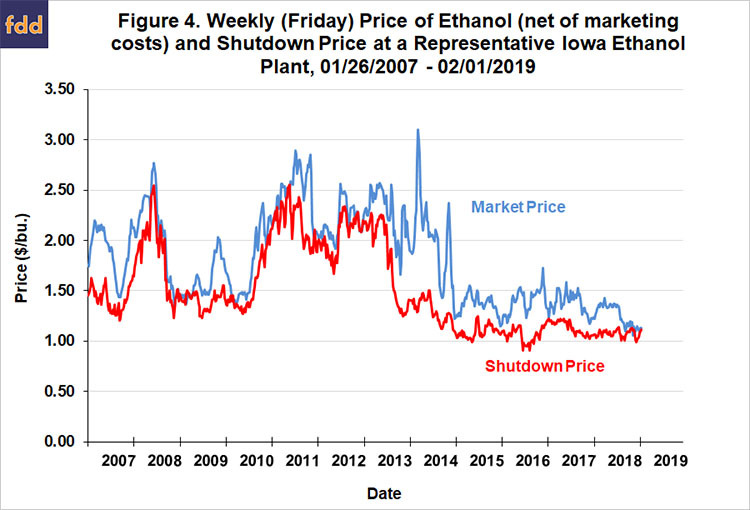 The depth of the losses experienced in the last five months of 2018 is highlighted in Figure 4, which shows the market price of ethanol at plants (net of marketing costs) and the shutdown price for the representative plant. The shutdown price equals variable costs minus non-ethanol revenue (DDGS and corn oil). The market price dipped below the shutdown price in late November 2018 for the first time since December 2012. The market price has remained very close to the shutdown price through early February 2019. There is no mystery as to the cause of the steep ethanol production losses in 2018. As highlighted in the farmdoc daily article of February 8, 2019, the U.S. ethanol industry was rocked by low prices in 2018, especially in the second half of the year when prices reached their lowest levels in over a decade. The real argument is the driving force behind the low prices. The ethanol industry has placed much of the blame for the low prices on small refinery exemptions (SREs) granted under the Renewable Fuel Standard (RFS) by the U.S. EPA. 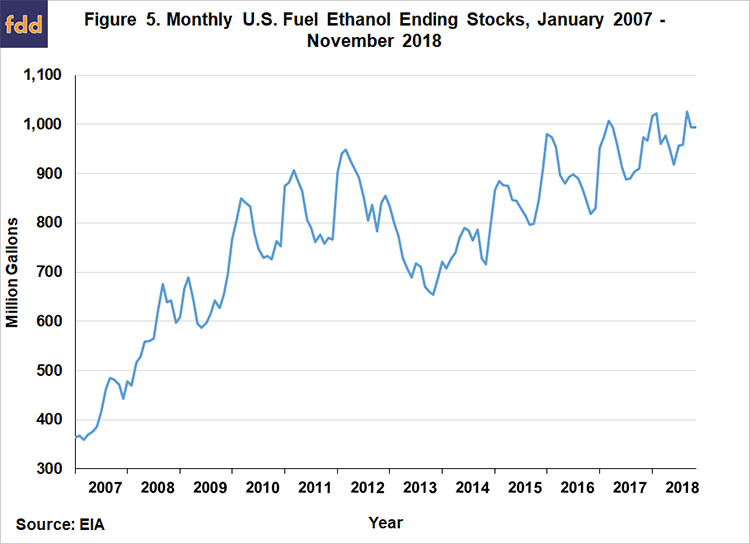 While there is no doubt that SREs have opened a backdoor mechanism for the EPA to reduce the statutory and obligated RFS volumes, the evidence shows that the physical use of ethanol has declined little if any during the last year (September 13, 2018; December 13, 2018; January 16, 2019; January 24, 2019; January 31, 2019). 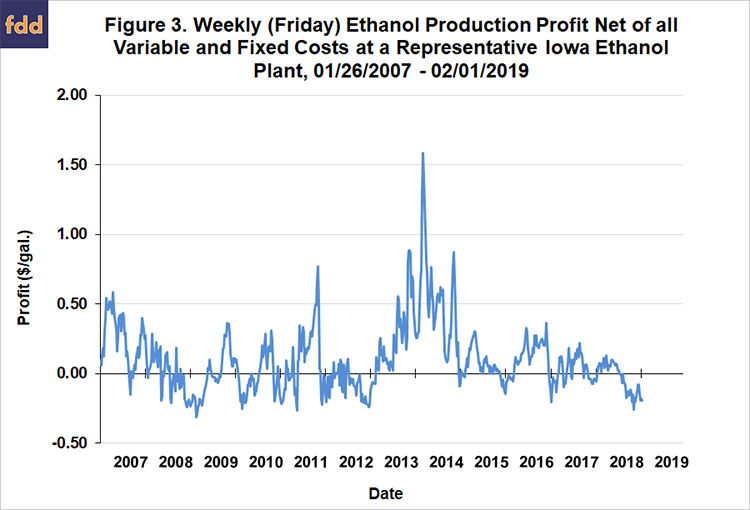 Instead, the evidence points to overproduction as the most likely explanation for the low ethanol prices (farmdoc daily, February 8, 2019). While domestic and export use for U.S. ethanol have increased since 2014, both production capacity and actual production have increased even faster. For example, ethanol production in the U.S. looks to have topped 16 billion gallons for the first time in 2018 and this has simply been too much for the domestic and export fuel markets to absorb. The result is that ethanol stocks have risen sharply (Figure 5) and this has led to declining ethanol prices and profits. Additional perspective on ethanol production profitability is provided in Figure 6, where the profit margins are aggregated over an annual horizon for 2007-2018. Profits are presented in terms of both total pre-tax net returns and percent return to equity. The 2018 net loss of -$2.2 million was the first annual loss since 2012 and only the fourth annual loss over 2007-2018. With the loss, the total cumulative (pre-tax) return to equity holders for the 2007-2018 period stands at $122.0 million, slightly less than the assumed equity investment for the representative plant of $126.6 million. We can use the average net loss for the representative plant to make a rough estimate of profit for the entire U.S. ethanol industry in 2018. Assuming all plants in the industry earned a net loss of -$0.02 per gallon and that total ethanol production for the U.S. was 16.1 billion gallons in 2018, aggregate ethanol industry (pre-tax) losses can be estimated at -$354 million. Finally, the percent return to equity holders provides useful information on the attractiveness of investment in ethanol plants relative to other investments. The average return was 8.3 percent over 2007-2018 and the standard deviation, a measure of risk, was 13.0 percent. By comparison, the average return for the stock market over this period, as measured by the S&P 500, was 8.7 percent and the associated standard deviation was 17.7 percent. The ratio of average return to standard deviation provides one measuring stick of an investment’s return-risk attractiveness, and on this measure the ratio for ethanol investment, 0.62, continues to compare favorably with the ratio for the stock market as a whole, 0.49. This provides important context when considering the losses experienced by ethanol producers in 2018. 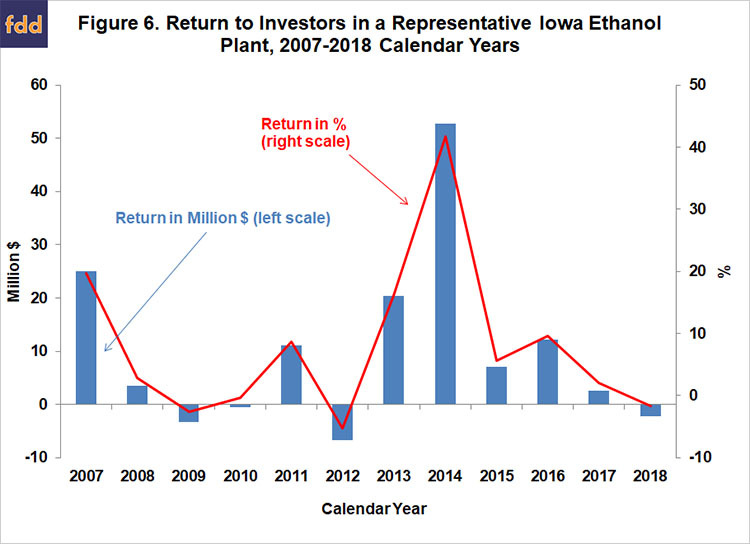 Even with this loss included in the data, ethanol plants have a more than respectable record of investment performance over the last dozen years. The ethanol industry in 2018 experienced its first losing year since 2012, thereby ending a run of five consecutive years of positive returns. The estimated loss for a representative Iowa ethanol plant in 2018 was -$2.2 million. While large, the 2018 loss was still far less than the -$6.7 million loss in 2012. The evidence points to overproduction as the driving force behind the low prices and financial losses experienced by ethanol producers during 2018. The fortunes of the U.S. ethanol industry are unlikely to improve until production and use are better balanced. This will require shuttering some production capacity, additional demand, or some combination of the two. The most optimistic scenario is additional demand for U.S. ethanol exports as part of a trade deal with China. Irwin, S. “Why are Ethanol Prices So Low?” farmdoc daily (9):23, Department of Agricultural and Consumer Economics, University of Illinois at Urbana-Champaign, February 8, 2019. Irwin, S. “Understanding the Price of E85 Relative to E10.” farmdoc daily (9):17, Department of Agricultural and Consumer Economics, University of Illinois at Urbana-Champaign, January 31, 2019. Irwin, S. “What’s Behind Rising E85 Use?” farmdoc daily (9):13, Department of Agricultural and Consumer Economics, University of Illinois at Urbana-Champaign, January 24, 2019. Irwin, S. “Small Refinery Exemptions and E85 Demand Destruction.” farmdoc daily (9):8, Department of Agricultural and Consumer Economics, University of Illinois at Urbana-Champaign, January 16, 2019. Irwin, S. “More on Small Refinery Exemptions and Ethanol Demand Destruction.” farmdoc daily (8):228, Department of Agricultural and Consumer Economics, University of Illinois at Urbana-Champaign, December 13, 2018. Irwin, S. “Small Refinery Exemptions and Ethanol Demand Destruction.” farmdoc daily (8):170, Department of Agricultural and Consumer Economics, University of Illinois at Urbana-Champaign, September 13, 2018. Irwin, S. “What Happened to the Profitability of Ethanol Production in 2017?” farmdoc daily (8):45, Department of Agricultural and Consumer Economics, University of Illinois at Urbana-Champaign, March 14, 2018. Irwin, S. “The Profitability of Ethanol Production in 2016.” farmdoc daily (7):18, Department of Agricultural and Consumer Economics, University of Illinois at Urbana-Champaign, February 1, 2017. Irwin, S. “The Profitability of Ethanol Production in 2015.” farmdoc daily (6):3, Department of Agricultural and Consumer Economics, University of Illinois at Urbana-Champaign, January 6, 2016. Iowa State University researchers have found that wind turbines located in agricultural fields are a plus for the crops growing around them. The overall effects on crops growing in wind farms appear to be positive said Gene Takle, Iowa State agronomy professor. He has led a team of plant and soil scientists along with extension specialists who have been looking into the effects since 2009. They started their work after seeing more wind farms and turbines pop up around the state. The new land use was positive for the landowners where they were located, but the researchers wondered if it was the same for the farmers growing crops. If the turbines change the microclimate for corn and soybeans, the team wanted to learn if it is a big enough change to be measured and the potential impacts. He said wind blowing across a corn or soybean field without turbines creates a certain turbulence that carries moisture from the transpiring crop, which rises into the atmosphere and pulls down cooler, drier air. At night the wind is calmer and the land cools. Turbines take some of the wind energy, slowing it down but increasing its turbulence so it interacts with the crop more, possibly increasing evaporation from the crop or moving carbon dioxide down into the crop. Since fungus and mold like a wet environment, the shorter the wet period makes it less favorable for the growth of those potential pathogens. In the fall, the shorter wet period could speed up harvesting because farmers typically have to wait for soybeans to dry in the morning. Another factor is that turbines bring warmer air down to interact with the cool air near the surface. Throughout the wind farm, the surface is a little bit warmer which inhibits dew formation. “Satellites can measure surface temperatures and you can see little dots across the state of Iowa and locate every wind farm because they’re slightly warmer than the surrounding area. So we know it has an effect that’s large enough to be seen there,” he said. Another plus is the air pressure fluctuation measured around wind turbines. Takle said there is a lot of carbon dioxide in the top few feet of soil — as much as two or three times what is in the air. The movement of air by the turbines pumps air down, and the movement draws carbon dioxide out of the soil so more would be available to the plant for photosynthesis. The air moving down also creates more plant movement, which increases sunlight penetrating the dense crop canopy. On the negative side is the tendency of higher temperatures occurring at night in wind farms. Considering corn, during the day it’s taking in solar energy and carbon dioxide to make plant material. At night it cools down and gives back some of the carbon dioxide, and it gives up more if it’s warmer. But overall crops grown in wind farms seem to benefit. His team would like to look at the result of wind movement through a farm as it slows and tends to move up, which could create clouds if the air is warm and moist, and potentially rain. “Are wind farms a preferential location for cloud formation or something that’s going to provide more rain in an area beyond the wind farm? We don’t know, we have some preliminary measurements that suggest that this is a real effect. Theoretically, you say yes there should be an effect, but is it large enough to be measured or to be important?” Takle asked. This fall most areas are good for fall weed control, but there will also be some areas that it may not be the best. Fall weed control can give the best weed control but it also can be a poor time. If the noxious weeds were sprayed or clipped earlier this summer and there is good weed growth now, this would be a good time to spray these weeds and get a good kill. However, if the weeds were not controlled early and now are tall, very mature and do not have a lot of regrowth you may not even want to make an effort because it will not do any good. The questionable area is where the weeds were maybe clipped earlier and there is regrowth or the regrowth is starting to dry up because of the dry conditions and is not growing well. These areas then become questionable to spray. If you want to spray these areas make sure that you use a spray that has residual effect so when the plant starts growing again after a rain, it will be killed then. Lastly, even though we have not had a freeze we are in September and the perennials have started to prepare for winter by sending nutrients down to the roots to help the plant make it through the cold winter months. If you have fall spraying for leafy spurge, Canada thistle, sow thistle, wormwood sage, and musk thistle to do now is the time, not when you get busy with harvest in the next few weeks. It is looking like at least some harvest surprises may be positive after an up-and-down 2017 season in Illinois. The September 1 yield predictions released by the USDA this week are for Illinois corn yield to average 189 bushels per acre, up a bushel from the August 1 estimate. The soybean yield estimate is unchanged at 58 bushels per acre. Both would be outstanding after the tough start to the year and dry weather at times over much of the state. Many soybean fields in east central Illinois are dropping their leaves, and harvest is getting underway. While we don’t expect as many 80+ bushel yields this year as we had in 2016, pod numbers look better than many had expected after dry weather in August and September. Rain now might boost yields by a little, but only in fields planted late or with late-maturing varieties where plants are still green. Cool temperatures in recent weeks have lowered water use rates, though, and we aren’t seeing the premature leaf drop that sometimes signals an early end to seedfilling due to lack of water. With high temperatures in the 80s now and expected for the next week or more, the process of shedding leaves and drying down will accelerate, and it will be important to try to harvest soybeans at seed moisture above 10 percent. While some rain would help lawns and still-green crops, it would be better for the pod integrity if it stayed dry until after harvest, especially if temperatures stay high. With high temperatures, seeds and pods following maturity will dry within hours instead of days, and we need to be alert and ready to harvest as soon as plants can be cut and seed moisture is at 12 or 13 percent. If moisture drops to 10 percent or less during harvest, it might be worth stopping until pods and seeds take on some moisture in the evening or overnight. Breeding and the use of improved combine headers have reduced pod shatter, but seeds less than 10 to 11 percent moisture can crack more easily. This might be one of those years with frequent switching between soybeans and corn harvest. The corn crop in many fields is also looking a little better than expected as the leaves dry down and ears start to drop. As of September 10, two percent of the state’s corn crop had been harvested, mostly in southern Illinois. Yield reported so far range from low to high, reflecting differences in planting (or replanting) time, ability of soil to hold water for the crop, and whether rain fell or didn’t fall at critical times. Nearly all of Illinois had below-normal rainfall in August, and little or no rain has fallen over most of Illinois during the first half of September. Dry soils during grainfill can decrease leaf photosynthesis, and when that happens, sugars are pulled out of the stalk into the ear to fill the grain. This leaves the stalks more susceptible to stalk-rotting fungi, and so more subject to lodging. So fields – especially those where leaves dried up earlier than expected – should be checked for stalk strength. Good growing conditions in July can increase the deposition of stalk-strengthening lignin, however, making stalks less likely to break even if sugars are pulled out. So as long as winds stay relatively calm, lodging is not expected to be much of a threat, especially in those parts of the state that received more rainfall in July and August. Below-normal temperatures in recent weeks – most of central and northern Illinois are now about 150 GDD behind normal since May 1 – have slowed grainfilling rates and delayed maturity of the corn crop. The cooler temperatures have probably been positive for yields, by extending the water supply into mid-September. But the mid-August predictions that early-planted fields would mature by late August or early September didn’t happen. With GDD accumulation rates now above normal, a lot of fields will reach physiological maturity quickly, and grain will start to dry down. High temperatures mean rapid grain moisture loss; we’ve seen moisture loss as high one percent per day under high temperatures, especially if it’s breezy. Dry conditions over the past month have limited the spread of ear rots. Most kernels now have the bright yellow color we like to see at harvest, and if the grain reaches maturity and can be harvested without an extended period of wet weather, we can expect grain quality to be good. Harvesting at high moisture and drying at high temperatures, or storing grain without proper care, can all compromise quality, however, and can mean getting a lower price for the crop. One issue that often comes up for discussion during corn harvest is that of corn test weight. If test weight turns out to be lower than the standard of 56 pounds per bushel, many people consider that a sign that something went wrong during grainfill, leaving yield less than it could have been. And, test weights in the high 50s or above are often taken as a sign that kernels filed extraordinarily well, and that yield was maximized. Neither of these is very accurate –high yields often have test weights less than 56 pounds, and grain from lower-yielding fields can have high test weights. Test weight is bulk density – it measures the weight of grain in 1.24 cubic feet, which is the volume of a bushel. Kernel density is the weight of a kernel divided by its volume, so does not include air like bulk density does. Kernel density is a more useful measure of soundness and quality than is test weight, but is harder to measure. A typical kernel density might be 91 pounds per 1.24 cubic feet of actual kernel volume. So a bushel of corn grain is about 56/91 = 62 percent kernel weight; the other 38 percent of the volume is air. Kernels with higher density tend to produce higher test weights, but only if they fit together without a lot of air space. Popcorn, as an example, has small, high-density kernels that fit together well, and a typical test weight of 65 pounds per bushel. Hybrid genetics, growing conditions, and grain moisture at which test weight is measured can all affect test weight. If kernels appear to be well-filled, without a shrunken base that can signal that grainfill ended prematurely, it’s likely that they filled to their capacity and that yield was not compromised even if test weight is less than 56 pounds per bushel. For reasons that go back to an earlier time, though, corn needs to have a test weight of at least 54 pounds per bushel in order to be sold as U.S. No. 2 corn, which is the most common market class. Corn with a test weight of 52 or 53 might not be docked in price if it can be blended with higher test weight corn to reach the minimum. That’s much easier to do in a year when test weights are generally good. We expect that 2017 might be such a year. This is the first in a series of iGrow articles that will be dedicated to the issues and questions we receive related to establishing, re-establishing, and maintaining grass-based plantings for grazing, hay, wildlife, and recreation. This series will attempt to address the issues related to grasslands in a systematic process that helps the reader to understand key concepts of grassland management, and thus better prepare the reader to set specific goals and objectives to achieve desired results. What do I want my grassland to provide? Of primary importance is to ask a few key questions: “what is it that I want my grassland to provide?”, “what am I willing to invest?”, and similarly, “what is the time frame that I expect results?”. For starters, we will consider the first question, “What do I want my grassland to provide?”. There are major differences in what can be achieved in grassland projects based on the history of the land and its management. Native (unbroken) sod in the form of grazing pastures or prairie areas has certain characteristics and potentials that planted or tame grasslands do not. However, there is great variability within the native sod category regarding historical use and management, which may include various grazing, haying, chemical, fire, or other management techniques. Past management often drives the direction of the plant community itself, impacting plant health and variety depending on the action. What native sod can provide in relation to desired goals, such as annual production or plant diversity, can sometimes be achieved, sometimes not, and is often dependent on whether the plant community has been ‘simplified’ through invasion of exotic species, past management, or both. In general, native sod that is not performing to its potential should be regarded as something to be healed through well-timed actions that focus on the plant community rather than something to be ‘fixed’ through mechanical soil manipulations. If the grassland is not native sod and is currently tame species or ‘go-back’ grass that has revegetated on its own, one still must consider past management. The potential of what the grassland can provide will be based largely on the species (native and non-native) that are now established. In these areas, there is often more opportunity to actively change the plant community through various manipulations than on native sod, though one must be realistic in expectations and timelines. If the area of concern is currently managed for row crops, cover crops, hay, CRP or some other cover, the opportunity to quickly establish or re-establish a desirable community is possible. However, past management in relation to soil conditions and residual chemicals can have a dramatic impact on establishment of new vegetation. How much one should invest to change a grassland plant community can be a challenging question. Input costs for soil preparation, seeding, and maintenance can be highly variable. One must first consider a strategy to ensure the soil is ready to receive the new plants. Profit potential can also be highly variable and is directly related to initial and ongoing input expenses. This article just scratches the surface of considerations related to maintaining and establishing grasslands. We will continue to explore the vast variety of questions posed by landowners seeking to improve their grassland resources. Herbicide-resistant weeds such as Palmer amaranth, waterhemp and horseweed (marestail) are spreading, increasing weed control costs and yield losses in soybeans. Because of this, producers need to take action to prevent or reduce the spread of these weeds. Combines, tractors and tillage equipment have been identified as some of the main culprits in spreading weed seed from field-to-field. The first step is to scout all of your soybean fields prior to harvest and determine if herbicide-resistant weeds are present. Most marestail is considered resistant to glyphosate and many populations are also resistant to the ALS-inhibiting (Group 2) herbicides. Palmer amaranth and waterhemp are commonly resistant to glyphosate and the ALS inhibitors and can be easily distinguished from other pigweed species by their smooth and hairless stems. Additional information on identifying and managing herbicide-resistant weeds is available at Michigan State University Weed Science. One of the most practical and effective methods of reducing field-to-field spread of weed seed is to harvest fields or areas of fields infested with herbicide-resistant weeds after harvesting all of your clean fields. When infested fields must be harvested before clean fields, a thorough top-to-bottom and front-to- back cleaning of the combine is recommended. However, this may take 4 to 5 hours, so it is probably not possible when moving from field-to-field. When a thorough cleaning is not possible, Iowa State University Extension agricultural engineer Mark Hanna recommends investing 15 to 30 minutes to remove at least some of the plant material before leaving the field. The steps to this procedure are listed below. Remove the combine head and open the doors at the bottom of the rock trap, clean grain elevator and the unloading auger sump. Clear the area around the combine to avoid injury from flying debris. Allow the combine to “self-clean” by starting it up and running it with the thresher and separator at full speed, the concave clearance and cleaning shoe sieves fully open and the cleaning fan set to the maximum speed. Drive the combine over the end rows or other rough ground to dislodge biomaterial. Shut the combine off and use an air compressor or leaf blower to clean the feederhouse, rock trap and head. Using a two-strap dust mask and eye protection is highly recommended when using an air compressor or leaf blower. Close the doors on the rock trap, elevator and unloading auger sump when finished. While the procedure outlined above will help reduce the quantity of weed seed moved from field-to-field by the combine, it is not as effective for removing small seeds as a complete top-to-bottom cleanout. Therefore, consider thoroughly cleaning the combine on rainy days and again at the end of the season. Information regarding a complete and thorough combine cleanout is available at “Recommended Procedures for a Complete, Top-to-Bottom and Front-to-Back Combine Cleanout” by Iowa State University and MSU Extension. Weed seeds also travel on tractor tires and tillage implements, so tilling your weed-infested fields after your clean fields is the best way to prevent spreading weed seeds during tillage operations. When this is not possible, remove as much soil as you can from all tires and the ground-working parts of tillage implements before entering a new field. The steps you take this fall to reduce the spread of herbicide-resistant weeds will also help prevent the spread of soil-borne pathogens such as sudden death syndrome, white mold and soybean cyst nematodes. PADE, which is free to use, is available at precision.ag.purdue.edu. It will help farmers make precision management decisions, Saraswat said. Data gathered from harvesters can show high- and low-yielding sections of a field, and soil tests can identify variable pH and nutrient levels in the soil. Such data is valuable in precision agriculture because it signals to farmers where nutrient deficiencies exist, allowing them to determine which management practices may be helpful. Making sense of it, however, usually requires uploading the data to an online tool developed and owned by a company that then has access to it and may require payments. Farmers that operate as small businesses may be reluctant to share such data outside trusted circles. PADE will help them address these issues by combining ease of use with privacy of data. PADE does not require users to log in or identify themselves or their farms. Users simply upload data to create bar charts, scatter plots and maps to visualize the data. One of the functions allows them to draw shapes in the farm ‑ that represent areas with special varieties or nutrient treatments ‑ to reveal average yields and area-related information. They also can obtain soil data from the Soil Data Access portal of the U.S. Department of Agriculture (USDA) Natural Resources Conservation Service and historical weather information from the National Weather Service to learn how soil variability, temperature and precipitation are affecting their soils or crops. Farmers also can create management zones based on variability expressed in the yield data and thus manage their farms better. Average soybean harvest losses range from one to two bushels per acre under normal conditions. However, harvest losses can increase significantly when harvesting tall, lodged plants or short, drought-stressed plants. Due to the variable distribution of precipitation across the state this summer, some producers will harvest fields with significant lodging and others will harvest short plants with brittle pods. The recommendations provided in this article will help soybean producers reduce their losses under either scenario. Properly timing your harvest operations is critical to reducing harvest losses. Harvest operations can begin any time after the beans have initially dried to 14 to 15 percent moisture. Depending on weather conditions, this is usually about five to 10 days after 95 percent of the pods have reached their mature color. Try to harvest as much of your crop as possible before the moisture level falls below 12 percent to reduce splits and cracked seed coats. Shatter losses have been shown to increase significantly when seed moisture falls below 11 percent and when mature beans undergo multiple wetting and drying cycles. Shatter losses can be reduced by harvesting in the morning or the evening when relative humidity is higher. Before harvest operations begin, inspect and repair the cutting parts on the header. Make sure that all knife sections are sharp and tight and all guards are properly aligned. Check the hold-down clips to ensure that they hold the knife within 0.03125 inch (thickness of a business card) of the guards. Adjust the wear plates to the point that they lightly touch the back of the knife. The main problem when harvesting lodged soybeans is the cutter bar will ride over uncut plants. The following recommendations will reduce this important source of harvest loss. Decrease your ground speed to 2.5 to 3 miles per hour. Increase the reel speed in relation to the ground speed incrementally to the point that the lodged plants are being cut and gathered into the combine without beating the beans out of the pods. Run the reel axle 9 inches to 12 inches ahead of the cutter bar. Contact the manufacturer for specific recommendations if using an air-assisted reel. If the plants are badly lodged in one direction, try adding vine lifters to the cutter bar and harvesting at a 30 to 45 degree angle to the direction of the lodging. If this doesn’t work, harvest all of the lodged plants in the direction opposite to way they are leaning. The main problems that occur when harvesting short beans are gathering short plants into the combine after they have been cut and excessive shatter losses due to brittle pods. The following recommendations will help producers reduce these important sources of harvest loss. Consider purchasing an air-assisted reel as the air stream produced by this equipment effectively moves short plants and loose beans and pods to the auger or belt. Consider removing the rock guard on the cutter bar if it is preventing short plants, loose beans and pods from moving to the auger or belt and you do not have an air-assisted reel. Harvest on an angle in fields planted in 15 inch or 30 inch rows. This will help the short plants feed into the combine more unformly. Of all the combine adjustments, improper reel speed and reel position cause the most shatter losses so pay close attention to these in drought-stressed fields. Set the reel to run 10 to 20 percent faster than the travel speed and lower the reel so that it contacts the top a third of the plants. Reduce the reel speed and/or raise the reel if beans are being flailed out of the pods. Shatter losses can be reduced by harvesting in the morning or the evening when relative humidity is higher. Farmers have been battling herbicide-resistant weeds for generations. A common practice for most of that time has been to rotate between different herbicides every season. But despite farmers’ best efforts, herbicide resistance has grown through the years, with some weed populations showing resistance to not one but four or five different herbicides. A new study from the University of Illinois explains why herbicide rotation doesn’t work. “If you were to ask farmers what is the one thing you can do to delay resistance evolution, they’ll say rotate herbicides. This study shows that’s not true,” says Pat Tranel, Ainsworth Professor in the Department of Crop Sciences at U of I.
Herbicide resistance results from random genetic mutations that keep weeds from being harmed by a particular herbicide. When farmers continually spray the same herbicide year after year, those with the mutation, referred to as a resistance allele, survive and reproduce. Over time, the proportion of plants with the resistance allele grows. Conventional thinking says that any defense trait—in this case, herbicide resistance—should come at a cost to the plant. It might be well protected against the herbicide, but it might not grow as tall, or flower as early. When the trait reduces a plant’s reproductive output, that’s known as a fitness cost. A fitness cost to herbicide resistance should be apparent in years when alternative herbicides are used. “If plants have glyphosate resistance, but they’re sprayed with 2,4-D, for example, the majority of those plants will die because they’re not resistant to 2,4-D. But no herbicide kills 100 percent of the weeds, resistant or not,” Tranel says. “You have to think about the small percentage that live. To test that assumption, Tranel and his research team designed a simple, if time-consuming, experiment. They took female waterhemp plants with no resistance alleles and allowed them to be pollinated by males with resistances to five different herbicides. Because female waterhemp plants can produce as many as a million seeds, it was easy to get the 45,000 they needed to start the experimental population. They scattered seeds on the soil floor of a greenhouse and just let them grow. When females started producing seeds, they were collected to start the next generation. Between generations, the researchers removed all the plants and made sure no seeds remained in the soil. The cycle was repeated for six generations over three years. How could the study test the efficacy of herbicide rotation if no herbicides were sprayed? It comes back to fitness cost. Remember, the assumption is that without the herbicide, the resistance allele offers the plant no benefit, and could carry a cost. The researchers were allowing those fitness costs a chance to play out during the study. “If the resistance alleles had a high fitness cost, we should have seen them decrease in frequency or disappear over the six generations,” Tranel says. Instead, the alleles for almost all five resistance types were essentially unchanged. Waterhemp has two known strategies to ward off glyphosate-based herbicides, such as Roundup, and the researchers tested the frequency of both. The other glyphosate-resistance mechanism involves the same gene. This time, it’s a specific mutation in the EPSPS gene that guards the plant against the effects of glyphosate. The researchers found that the mutation in EPSPS actually increased about 10 percent in each generation. Tranel thinks it may have been easier for one mechanism to replace the other because they both involve the same gene. The article, “Limited fitness costs of herbicide-resistance traits in Amaranthus tuberculatus facilitate resistance evolution,” is published in Pest Management Science. Tranel’s co-authors include Chenxi Wu and Adam Davis, from U of I. The study was supported by a grant from USDA NIFA [grant no. 2012-67013-19343]. Now is the time of year to be looking for palmer. Palmer amaranth is in the pigweed family and has a lot of close relatives that can be confused with it. Common waterhemp is the one that is most commonly confused with palmer. We also have spiny pigweed, tumble pigweed, smooth pigweed, and redroot pigweed that can be confused with palmer. A few keys to look for on palmer are that some of the petioles (the short stem from the main stem to the leaf) will be a lot longer than the leaf length. Also, the area where the stem connects to the petioles will have spines on it. On palmer the leaf is more cordate (heart shaped) than waterhemp which is more elliptic (oblong). Lastly the head will be long and if female will also be spiny. There is no one thing to look for that is a sure sign in all cases that the plant is palmer. It seems like we are more likely to find it in areas that have stress periods. So far we have found it mainly in the central part of the state, and usually we will find it in sunflower or soybean fields. If you suspect you have palmer amaranth start by taking pictures to have it identified. Take pictures of the whole plant, the leaf and petiole area, the stem and petiole area, and a picture of the seed head. Email the pictures to Paul O. Johnson and make sure to send the highest resolution picture as possible it will help with the identification. Please include the best contact information to return the identification or ask more questions. For more information, contact Paul O. Johnson. Although Midwestern soybean growers have yet to experience the brunt of soybean rust, growers in the southern United States are very familiar with the disease. Every year, the fungus slowly moves northward from its winter home in southern Florida and the Gulf Coast states, and eventually reaches Illinois soybean fields—often just before harvest. Research shows there is a possibility the disease could jump much longer distances and reach the Midwestern soybean crop earlier in the growing season. Studies suggest that air masses moving from the south could sweep up rust spores from infected plants (kudzu or soybean) and transport them hundreds of miles north earlier in the season, potentially endangering the Midwestern soybean crop. This could be happening right now as the storm system that created Hurricane Harvey moves north, according to Glen Hartman, a USDA Agricultural Research Service plant pathologist and professor in the Department of Crop Sciences at the University of Illinois. After all, hurricanes have been responsible for long-distance movement of rust spores in the past; scientists think Hurricane Ivan brought soybean rust to the United States from Colombia in 2004. Although long-distance movement can and does happen, short-distance spore movement has been responsible for most of the annual northward spread of the disease since 2005. Hartman thinks this short-distance movement has been occurring as usual this season and, barring any unusual fallout from Hurricane Harvey, he expects to see rust showing up in Illinois soybean fields late in the 2017 season. It is this short-distance movement that intrigues Hartman; he says predictions of long-distance spread haven’t taken real-world spore movement into account. Without knowing the number of rust spores that actually escape from the canopy and the conditions that favor spore dispersal, long-distance spread models could be inaccurate. So, in a recent study, Hartman and his colleagues placed two kinds of spore-collecting traps in, around, and above rust-infected soybean fields in Alabama, Georgia, and Florida. The team also measured environmental data, including air temperature, relative humidity, wind speed and direction, precipitation, and leaf wetness. The majority of spores stayed within the canopy, but a proportion (one-third to one-half) floated above. Spores moved laterally away from the field, too, but most stayed within 50 feet, with about half as many moving out to 200 feet. These numbers explain how short-distance spread of this disease typically works. Rust might spread within a field, then jump to a nearby patch of its alternative host, kudzu. Considering how much kudzu is spread around the south, it’s a good bet another soybean field is within a couple hundred feet. From there, it jumps again, moving incrementally to the north. In an average summer, Hartman says, soybean rust rolls up from the south at a rate of about 30 miles a day. Hartman’s study also identifies environmental factors that favor or impede short-distance movement of rust spores. Using a statistical approach known as machine learning, the team found that spores went farther in hot and windy conditions, and stayed closer to the canopy in humid, wet conditions. The study explains short-distance transport, but how do the results inform predictions of long-distance movement? In other words, the chances of spores making it out of the canopy and picked up by updrafts for long-distance movement might be lower than assumed. And the chances are lower still if you consider what it’s like for spores to survive in high-elevation air currents. “Spores in these high-elevation air masses are exposed to temperature extremes and to UV radiation. Not many spores survive that, although those that are darkly pigmented may have a better chance. Soybean rust spores have very little pigment, and lightly pigmented spores are very susceptible to UV,” Hartman says. New models will need to incorporate Hartman’s findings to better predict the chances of long-distance movement of soybean rust throughout the U.S. and other parts of the world. For further information regarding soybean rust, Hartman suggests the soybean rust website, http://sbr.ipmpipe.org. He also encourages Midwestern soybean growers to contact their local Extension office if they see symptoms of rust developing earlier than usual. The article, “Prediction of short-distance aerial movement of Phakopsora pachyrhizi urediniospores using machine learning,” is published in Phytopathology. Hartman’s co-authors, Liwei Wen and Roger Bowen are also from the University of Illinois. The pre-harvest interval (PHI) on a pesticide label is a time period following a pesticide application when a crop must stay in the application site and cannot be removed from there. Brokers, co-ops and other receivers of commodities for processing inspect producer’s pesticide application records to determine if PHIs were observed before they will accept the crop. The pesticide label’s “Directions for Use” section begins with the statement: “It is a violation of Federal Law to use this product in a manner inconsistent with its labeling.” The label is a legal document and this statement is telling the applicator using a pesticide in a manner not permitted by the label is wrong. Harvesting before a PHI expires is illegal. The Michigan State University Pesticide Safety Education Program is receiving telephone inquiries about how harvesting before a PHI has expired can be done. The inquirer in one circumstance had applied a fungicide with a label stating the PHI was longer than the anticipated time of harvest. The inquirer reported they needed to harvest in two weeks and the fungicide has a 45-day PHI and asked if there was an antidote for the pesticide. Another inquirer submitted samples to a lab for residue testing and received a report that the residue was below Food Quality Protection Act (FQPA) tolerances for the commodity. Again, they needed to harvest before the PHI expired and wanted to know if they did not have to observe the PHI. The answer is, in any case, harvesting cannot happen before a PHI expires. The responsibility for a compliant pesticide application belongs to the applicator. A well-planned pesticide application begins with reading the entire pesticide label to insure the pest is managed and all other mandatory label requirements are met. Growing degree days (GGDs), while not perfect, are a more reliable method of predicting crop and insect development than calendar days. Differing threshold temperatures and beginning accumulation dates are used to determine accumulated heat units for different crops. For example, a cool-season crop like alfalfa uses a threshold temperature of 41 degrees Fahrenheit and a starting date of March 1, whereas a warm-season crop like corn uses a threshold temperature of 50 F and the planting date as the starting date. The threshold, or base temperature, is the temperature under which no significant crop development is expected. That is, it is assumed alfalfa does not grow at temperatures less than 41 F and corn does not grow at temperatures less than 50 F. Also, an upper-end cutoff temperature is used in the calculation. Crops don’t grow any more at temperatures greater than 86 F than they do at temperatures less than 86 F. Keep that in mind later when we talk about calculating GDDs. There are two methods for calculating GDD. The first method is simpler and the second method involves higher level mathematics, but is more accurate, especially at cooler temperatures. There are a couple things to remember when using the temperature averaging method. Since plants don’t grow any more at temperatures greater than 86 F than they do at temperatures less than 86 F, we use 86 F as the maximum temperature for any temperature greater than 86 F. Also, negative values are recorded as zero. Let’s try a couple examples. First, assume a high of 83 F and a low of 61 F on a given day. Degree-day accumulation base 50 = [(83 + 61) / 2] – 50 = 22 accumulated growing degrees for that day. Now let’s look at a cooler day, a day with a high of 57 F and a low of 33 F.
Degree-day accumulation base 50 = [(57 + 33) / 2] – 50 = -5, a negative number, so we record zero. But wait—at least part of the day was greater than 50 F. Wouldn’t there have been some plant growth and development? Yes. As limited as it might have been, there would have been some plant growth and development, and that is the limitation of the temperature averaging method. The Baskerville-Emin method fits a curve to the various temperature points that are greater than the base temperature, then calculates GDDs from the area under that curve. That’s a little more math than most people can do on a piece of note paper, but it does a better job of calculating heat accumulation, particularly during the beginning of the growing season when temperatures are still cool. When temperatures are still cool in spring, referencing tools such as Michigan State University Enviroweather and finding nearby weather stations can help get more accurate GDD totals. An understanding of plant and pest development at various GDDs can be helpful in making a variety of management decisions, like cutting alfalfa and corn silage, as well as decisions on scouting for insect pests. Here are some tips to the correct sampling procedure that is critical to getting reliable data from this test. The time for stalk sampling is critical. It is two to three weeks after physiological maturity or when black layers have formed on about 80-90 percent of the kernels. At this stage, any further mobilization of nitrogen from the plant to the kernels has ceased. Typically, most leaves and stalks have turned brown at this stage. The portion sampled is the 8-inch segment of stalk between 6 and 14 inches above the soil. Collect 12-15 segments within an area no larger than 10 acres. Remove all the leaf sheaths from the segment. The sample needs to be taken at random, but any plant with stalk rot should be discarded. The rot destroys the pith area of the stalk, rendering it dark brown to black. Notice the color of healthy stalks in the photo. Plants adjoining a skip should be avoided. Areas with different soil types or management histories (manure practices and previous legume crops such as alfalfa and clover) should be sampled separately. Hybrids with different maturities and widely different planting dates may require different sampling dates. Place samples in paper (not plastic) bags to allow some drying and minimize mold growth. Send to a laboratory as soon as possible. Refrigerate samples (do not freeze) if stored for more than a day before mailing. Most soil testing labs in your area will offer this test, such as A&L Great Lakes Laboratories, 3505 Conestoga Dr. Fort Wayne, IN 46808. For questions regarding shipping, cost and the test, contact your local soil testing lab or A&L Great Lakes Laboratories at 260-483-4759. Although this test does not provide any remedy for the current year, familiarity with the data over a number of years including wet and drought years should assist producers in fine-tuning their nitrogen fertilizer practices.